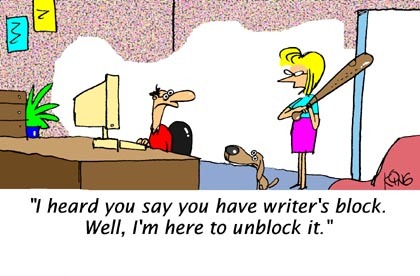 If you write, you’ve likely experienced writer’s block a time or twenty. It’s part of the journey, one of the things we have to find ways to work through. I like to change the location of where I write, maybe take a notebook and pencil down to the beach or a coffee shop. Anything to get my brain in gear. Writer’s block has not been a problem for me so far this year, mostly thanks to the genius of Cara Michaels and #WIP500. I have written every day this year, no problem filling up page after page on my new WIP. The issue I’ve run into is that the words are there, but they are void of imagination. I am officially suffering from creativity block. I mentally ball up the pages I’ve typed and chunk them into a tall metal waste basket saying, ‘Garbage, garbage, ridiculous garbage.’ Some of it reads like an article for a newspaper specializing in how paint dries. Over the next few weeks I am going to put some of these tips and ideas to the test. I’ll let you know how it goes! What ways do you get your creativity rolling? I'm sort of new to the writing game with so many ideas in my head that right now, at least, the creativity part isn't a problem. Nor has writer's block been. But. I'm sure it will rear its ugly head sooner than later so thanks for these links! Blogfests really do help. You agree to write with something picked as the topic already and then get to read how others took the same idea and made it into something different. I have a blog hop planned with a three other bloggers that starts Monday :) Super excited!! Thanks for what you do for writers! Thank you for the award!! I've found that doing some flash fiction helps and I use http://bighugelabs.com/random.php for inspiration for that. I either push through the writer's block and write anyway, even if it's no good, or I take a little break and let me story sit for a few days and go back to it and that seems to help. Yeah, taking a break and letting stuff breathe for a few days works for me often as well. I did a writing for children course at the end of last year and my tutor told us to just try and write everyday. Even it it's a little something or note form. She also would get us to complete five minute 'free writing' exercises (which I've covered on my blog), which work quite well to get the brain in gear. Thanks for the links - I'll take a look through those shortly and looking forward to hearing more of your tips soon. My imagination kicks into overdrive as soon as I am unable to write, e.g. just before I fall asleep, while I'm in the supermarket, while I am driving too fast up the motorway. If I try to think about it while staring at a screen, nothing comes... I have taken to making voice notes whenever inspiration strikes. Also, I get ideas from random stories in newspapers. Some of that stuff defies any imagination! Why thank you :) And, I have the same problem where I come up with my favorite stuff right before I fall asleep. I'm working on inventing something to read my mind and transcribe it. I will let you know when it's complete!